Post your thoughts from day one of the draft in this thread and GO LIONS! I am hoping for one of these guys to be a Lion by the end of the day's festivities.. I would personally solve the RB position if the opportunity is there. If Guice is on the board. I take him. If not, who is the best player on the list. Maybe a DE or DT then. I am hoping one of these RB is ours by Sunday. Lots of backs this year. I think these are the best ones, FWIW. I think it might be hard to get one of my top 3 by pick 51. If you think the 8th guy on the list is as good as Guice, maybe we should pass and wait. I don't think that. I think there will be a run early in rd 2 for the names I am drawn to want. Should be some good OC or OG at 51 or maybe even rd 3. If a blue chipper that slides through the cracks happens, or if a trade back happens, hard to know who they want or like. Staying put, I believe (hope) we'll be selecting from the following group. I know they're all D guys, but too me that's the greatest need, and I don't see an O player at 20 that's gonna make a huge difference for us. There's just way to many RB's that will be available later, thereby eliminating the need for an early investment in a back. OK, I get it, he's possibly the best Center in the draft, but with our 1st round pick it seems to me we could have gotten defensive help. Maybe they plan to have a defense held together by kite string and chewing gum like MP was used to in NE. A running game helps the defense. This guy should definatly help the run game up the middle. At center I had Price, Daniels and Wynn (who could also be a tackle or guard) all rated higher but didn't pay that much attention to the position as I thought they would go guard instead. Thought they would jump at Landry... If going interior OL, I liked Hernandez better and keep Glasgow at C.
As for Ragnow, he was the highest ranked lineman (93.7) by PFF. High ankle sprain in week 7 this year probably hurt him in some All-American voting. Ragnarok lets Glasglow stay at guard and improves the interior. Helps the running game and I'm guessing RB will be selected tomorrow or saturday. As for DE, my guess is they value OLB pass rushers and we're just so used to a 4-3 defense that we're not seeing the value still available. Without knowing the plan, it's hard to even speculate at what the needs/desires are right now. Surprised they didnt take Landry (or anyone else for that matter) but Ragnow at center was a huge need. Despite throwing a lot of resources at the OL, they have been no better so far. a good runner helps the OL also and they still need to add that. when do they get the defenders? lions started a lil run on the OLmen, wonder if a trade was available for them to pick up an extra pick and if they considered it. i think ragnow will be a good player but a lot of teams get there interior line in the middle rounds and do fine which allows them to get studs at the premium positions. I think we have all been to caught up in the DL. Patricia likes his guys to 2-gap and there should be some good OLBs in the 2nd or 3rd to help the pass rush. I'm looking at Lorenzo Carter in the 2nd or 3rd. I'm really curious where Ragnow plays on the line. I assume they move him to guard since Stafford has been working with Glasgow at center for larger portions of 2 seasons, but it seems kinda odd to take a top center prospect to play guard when you could take one of the top guard or tackles instead. He's is on my list, but I didn't think he was a round 1 guy. Let's hope he's as good as they think. Looks like another year of not getting a high caliber back. Hoping you get lucky late is not a real strategy in my mind. There are still RBs left on the board like Guice, Chubb, and Jones. Not sure how you can say they are not getting a high caliber back after just the 1st round. I'm hoping Nick Chubb falls to the 3rd, so they can get a top defensive player in the 2nd or if he falls far enough I would love to see Guice in the 2nd. I'm not convinced. Last year, we were the worst in the NFL at rushing. I don't believe that swapping Swanson for Ragnow is the solution to that issue. I don't see our team improving much with this pick. How much is our Oline going to be paid this year? We have a 1st rounder at left tackle, 1st rounder at left guard, 3rd rounder at centre, the NFL's fifth highest paid right guard, and highest paid right tackle. Ultimately in a salary cap league, getting value for your $ is key. Having such a highly paid unit produce average play is not the route to success. Ragnow will be paid like an average starting guard (he gets about $2.5m per year, per Spotrac NFL starting Guards get paid $2.5m per year). In contrast an average DE or DT gets around $5m - so if you hit on a DL at 20 (ie draft someone who's NFL average or better), you generate over $3m in value. If Ragnow pans out, we generate potentially $0. Our offense is not going to be transformed by this - an every down back, so we don't telegraph run or pass via personnel any more might have done that. Our defense, particularly the line, has tonnes of holes. Ragnow certainly doesn't sound like the BPA from more analysts draft boards. It's the draft, so it's easy to have strong opinions that over time get proved spectacularly wrong. And I hope I am proved spectacularly wrong on this. But I am definitely not excited by this pick, continue to be underwhelmed by everything about this offseason, and am not looking forward to the 2018 season with much hope. As for the backs, I won't be surprised if we don't take one on day two. Still alot of good defensive talent left, and if we're gonna be RB by committee no need to take one early. Day three? I agree. 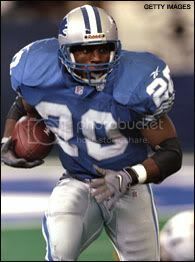 It wouldn't surprise me if the Lions pass on RBs again this year. I was just saying it's a little early to say they are not getting a high caliber back. It is still a possibility this early in the draft. I wonder if Guice is falling like Landry due to medical. The pats took Michel over him and maybe even if he falls to the Lions they still pass.